First a sailor, then a successful stockbroker in Paris, Gauguin began painting as a hobby in his mid-twenties. He soon allied himself with the Impressionist artists and exhibited with them from 1879 to 1886. In protest against the ills of civilization, he resolved to live primitively and eventually settled on the South Pacific island of Tahiti. This picture, painted during the first of two extended stays there, shows Gauguin's rejection of naturalism for stronger, unreal color and striking simplification of form, all of which had a strong influence on modern art of the early twentieth century. 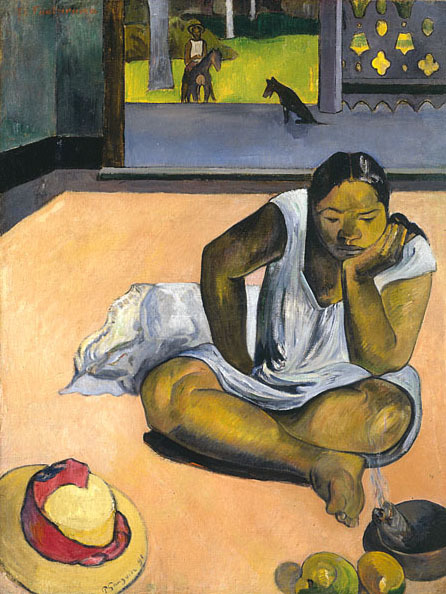 The silent and meditative subject of The Brooding Woman (translated from the original Tahitian title, Te Faaturuma) conveys the sense of mystery that the Polynesians evoked in the artist. He considered this painting among his best from the earlier Tahitian stay, and it was eventually acquired by the French Impressionist artist Edgar Degas, who owned a number of works by Gauguin.